Department of Radiation Oncology 1, J. K. Cancer Institute, Kanpur - 208019, Uttar Pradesh, India. Department of Radiation Oncology 2, Super Speciality Cancer Institute, Lucknow - 226002, Uttar Pradesh, India. ABSTRACT: Background: The standard management of operable LABC is by initial modified radical mastectomy. Because of the high risk of metastasis, systemic therapy is involved as an additional integral part of treatment. The postmastectomy radiation is given to reduce the high risk (20-40%) of loco-regional relapse following adjuvant systemic therapy. The loco-regional control ranges from 85% to 90% for 10 years survival of 40% to 50% for operable stage III breast cancer treated through modified radical mastectomy, adjuvant systemic therapy, and post-mastectomy radiation. Objective: The Aim and objective of the study were to compare the loco-regional response in two arms for 4 weeks after completion of radiation therapy and at the end of six months of follow up and to compare acute and chronic toxicities in the two arms. 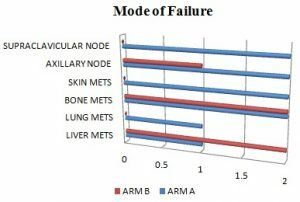 Methods: In this study, patients with histopathologically established breast cancer were selected from out-patient Department of J. K. Cancer Institute Kanpur and were placed randomly into two different arms. Arm A delivered “40 Gy in 15 fractions over 3 weeks,” and Arm B delivered “50 Gy in 25 fractions over 5weeks”. Results: The study summarises that a radiotherapy schedule delivering 40 Gy in 15 fractions over 3 weeks seems to offer significantly less acute toxicity as well as cosmetic appearance statistically significant, however in terms of loco-regional recurrence as well as distant recurrence 40 Gy schedule appears to be less effective especially in advanced stages, although data was statistically not significant. Conclusion: A long term follows up on the patients of this study will analyze the exact figure of locoregional relapse as well as distant relapse. INTRODUCTION: Worldwide, breast cancer is considered as the 2nd most frequent cancer amongst females 1, and significantly dominant amongst females of developed countries. The age harmonized the breast cancer frequency rate in India is 22.9% per 100,000 females 2. On the basis of "Indian Cancer Registry", breast cancer is the dominant throughout all its "Population-Based Cancer Registries" (PBCRs) with 27.3% of patients in Bangalore, 26.8% of patients in Chennai and Delhi, 29.7% of patients in Mumbai and 26.3% of patients in Kolkata “PBCR 2009-2011”, as well as in "Hospital Based Cancer Registries" (HBCRs) of Mumbai with 30.3% patients, in Thiruvananthapuram with 28.5% patient and Dibrugarh with 14.8% patients. The “Indian Cancer Registry” principally obtains its data from the "Metropolitan Cities" having high urbane population. The reports selectively obtained from the rural area described that the "cervix" as the principal cancer site and closely followed by the breast 3. Soon, the scenario will change because all the registries illustrate a rising tendency in breast cancer cases percentage over the years. More than 3% changes were reported from “Bangalore” and “Chennai” while between 1-2% changes were reported from “Delhi,” “Bhopal” and “Mumbai” over the years 4. By 2020, breast cancer goes beyond cervical cancer and become the most common type of cancer among Indian women. Multiple factors are associated with an increased risk of developing breast cancer including having a family history, particularly in mother or siblings, a past medical history of uterine and colon cancer; early menarche; late menopause; no pregnancy or first pregnancy after age 30; radiation exposure; post-menopausal estrogen therapy and consumption of contraceptive pills. The genetic analysis led to the discovery of the dominant genetic mutation in two tumor suppressor gives BRCA-1 and BRCA-2 localized to chromosome 17 and 13 respectively. For treatment, various options are available including neo-adjuvant chemotherapy, surgery, adjuvant chemotherapy, radiation therapy, and hormone therapy. In 1997, Overgaard et al., 5 concluded, the unorganized trial that adding up of postoperative radiation to mastectomy with adjuvant chemotherapy reduces loco-regional recurrence and prolongs survival in a high-risk premenopausal woman with breast cancer. In 1997, Regas et al., 6 concluded that in a randomized trial that the radiotherapy combined with chemotherapy after modified radical mastectomy decreases the risk of systemic and loco-regional relapse and reduces mortality. The international standard radiotherapy regimen after breast conservation surgery or mastectomy for early breast cancer delivers 25 daily doses (fractions) of 2.0 Gy to a total dose of 50 Gy over 5 weeks. This schedule has evolved pragmatically and is based on the assumption that a high total dose delivered in small fractions of 2.0 Gy keeps the amount of normal tissue damage to a minimum while gaining the maximum level of tumor control 7. This perception was strengthened when early studies of hypofractionation, which did not use adequate reductions in total dose, reported unacceptably high rates of normal tissue injury. In this study, patients with histopathologically established Breast cancer were selected from the out-patient department of J. K. Cancer Institute Kanpur and were placed randomly into two different arms. Arm A specified with “40 Gy in 15 fractions over 3weeks” and Arm B specified with “50 Gy in 25 fractions over 5 weeks”. The study aimed to compare the loco-regional response in two arms for 4 weeks after completion of radiation therapy and at the end of six months of follow up and to compare acute and chronic toxicities in the two arms. Patients: The case material for the study will be selected from the cross-section of patients registered at the ‘J. K. Cancer Institute’ and other associated hospitals of ‘G.S.V.M. Medical College, Kanpur, India’. Histological proven infiltrating duct carcinoma of the breast with biopsy will be registered and will be randomized into two arms. Procedures: Patients were randomized to 50 Gy in 25 fractions over 5 weeks or to 40 Gy in 15 fractions over 3 weeks. Randomization was arranged via lottery system by opting chit from a box of multiple chits. Randomization was blinded. Use of adjuvant systemic treatment was recorded, with a requirement of at least a 2 week gap between exposure to chemotherapy and radiotherapy. The treatment was delivered in a supine position. The planning target volume was defined as the whole breast wall with a margin of 1 cm to an inframammary line where regional radiotherapy was indicated, the planning target volume was supraclavicular nodes with an axillary chain with a margin of 1 cm. Most of the patients were treated with cobalt 60, and a few were treated with a 6MV linear accelerator. Planning protocols were specified at the time of notification of participation in the study and had to conform to the minimum quality criteria described in the protocol The START Trialists’ Group 10. Doses were prescribed the two international reference points. The principal endpoints specified in the protocol were a local-regional relapse, normal tissue effects, and quality of life. Loco-regional tumor relapse was defined as local relapse in breast or chest wall, and regional relapse in ipsilateral axilla or supraclavicular fossa if it had been within an irradiated target volume. Any ipsilateral regional relapse outside the radiotherapy target volume was excluded from the analysis of local-regional relapse. Normal tissue effects in the chest wall, arm, and shoulder were assessed by RTOG criteria for skin reactions, patient self-reported assessments, and physician assessments. Other endpoints were disease-free and overall survival and health economic consequences. Disease-free survival was defined as time to any breast cancer-related event (local-regional or distant relapse, contralateral breast cancer, or death from breast cancer). The cases of ischaemic heart disease, symptomatic rib fracture, and symptomatic lung fibrosis were recorded during follow-up; incidence with and without confirmation of diagnosis (e.g., using imaging and further investigation) was included. Brachial plexopathy was reported if damage to the brachial plexus was suspected and the patient had symptoms of pain, paraesthesia, numbness, or other sensory symptoms (graded on a 4-point scale). Suspected cases of brachial plexopathy were subject to confirmation by neurophysiological assessment and MRI. The patients were reviewed every month for tumor relapse and radiotherapy-induced normal tissue effects. Since, patients had undergone mastectomy only related changes in skin appearance after radiotherapy were recorded. Pre-treatment Evaluation: The pre-treatment evaluation in all patients included- complete history, general physical examination, complete systemic examination, body surface area (BSA). The assessment of general condition was done by using the ‘Karnofsky Performance Status’ (K.P.S). Haematological assessment will be done by complete hemogram including "haemoglobin", "total leukocyte count" (TLC), "differential leukocyte count" (DLC) and "platelet count" biochemical assessment to assess the kidney and liver functions were done by the estimation of blood urea, serum creatinine, SGOT, and SGPT levels. Radiological assessment included chest X-ray and USG whole abdomen for all the patients. Inclusion Criteria and Exclusion Criteria: The patients were staged according to inclusion criteria and exclusion criteria. Based on the above assessments the patients for the study were selected depending on the inclusion criteria including- histologically proven cases of breast carcinoma, post-mastectomy with clear tumour margins either already received chemotherapy or planned for chemo after radiation; patients on hormone therapy are also included; complete hemogram with Hb>10gm/dL; TLC>4000/cmm, platelet count >100,000/cmm. ; renal function tests with blood urea <40mg/dL and serum creatinine<1.5mg/dL; liver function tests with SGOT < 35IU/L and SGPT <40IU/L, and patients who signed the informed consent and were ready to be on follow up as required. The patients excluded from study having following conditions were the same disease with prior radiation, cases having distant metastasis, patients having a pregnancy or lactating patient, associated medical condition(s) such as renal disease, liver disease or heart disease. Assessment during Treatment: The patients incorporated in this study were assessed carefully and regularly while on treatment. The complete clinical evaluation for the tolerance of each patient to the delivered treatment was done by thorough local examination of the patient for local disease status besides the examination of acute toxic side effects caused by radiation. The radiation reactions were assessed by criteria of “Radiation Therapy Oncology Group” (RTOG) and “WHO” toxicity criteria. Assessment after Treatment: All the patients were assessed four weeks after the completion of treatment, to detect acute complications like skin reaction. The acute treatment linked toxicity was categorized using general terminology criteria for acute undesirable events (RTOG). Follow Up: All the patients were followed up regularly on OPD basis for at least 6 months, once every month after completion of the treatment. At every visit, each patient was clinically evaluated for local control of disease and treatment-related complications. The patients were assessed for any evidence of distant metastasis during each follow-up. For evaluation of the local disease control, local examination by inspection and by the palpation was done at all follow-up and outcomes were considered. On suspicion of any local recurrence, the biopsy will be taken for histopathology and correlated clinically. For evaluating the distant metastasis complete history referring to several symptoms will be taken, and the general physical examination will be done. The relevant investigations will be done in case of suspicion to dismiss the distant metastasis. The results of the study regarding safety, tolerability, toxicity, and response in all the groups were documented. Statistical Analysis: Survival analysis methods were used to compare the rates of each endpoint between the fractionation schedules. Length of follow-up was calculated as time from the last fraction of radiotherapy until the time of the first event or last follow-up assessment, whichever occurred first. Patients were still evaluable for the late effect of RT local-regional relapse after distant relapse but were censored at the date of death. For the patient quality of life self-assessments of normal tissue effects, an event was defined as the first occurrence of a moderate or marked symptom (graded “quite a bit” or “very much”). The chi-square test was used to compare fractionation schedules. Crude hazard ratios (with 95% CIs) comparing fractionation schedules for each endpoint were obtained from Cox proportional hazards regression models. Since point estimates of differences in event rates can, by chance, be atypical of the overall pattern of differences between schedules, estimates of the absolute difference in 10 month event rates taking the whole range of observation times into account were obtained by applying the hazard ratios obtained from the Cox model to the Kaplan-Meier estimate of the rate in the 50 Gy control group. Both one-sided and two-sided 95% CIs were calculated for the absolute difference in local-regional relapse rates at 10 months, since the upper limit is of greater clinical interest, given concern about a possible excess risk caused by hypo-fractionated schedules. The analysis included all randomized patients on an intention-to-treat basis. RESULTS: From January 2015 to July 2016, at “J. K. Cancer Institute, Kanpur,” a total of 101patients were enrolled in the study that was posted MRM and received 6-8 cycles of anthracycline or taxane or both-containing regimen, which was balanced amid randomized radiotherapy schedules. The cyclophosphamide and the fluorouracil combination therapy were also prescribed in combination with an anthracycline, which was similarly balanced between the randomized groups. Of women ER or PR positive, hormone therapy was also prescribed, either tamoxifen or letrozole. 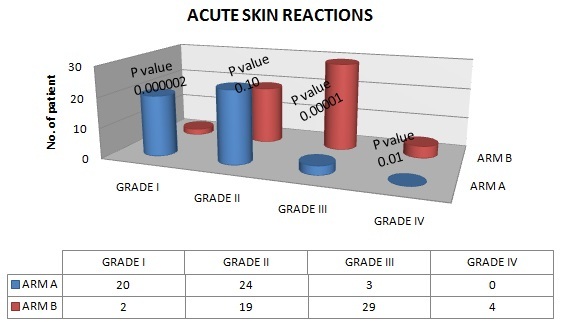 At the end of radiotherapy patients were assessed for acute skin toxicity with RTOG criteria in arm A, 20 (42.55%) patients had “grade I” reaction, 24(51.06%) patients had “grade II” reaction, 3(6.3%) patients had “grade III” reaction and no patients had “grade IV” reaction while in arm B 2(3.7%) patients had “grade I” reaction, 19(35.18%) patients had “grade II” reaction, 29(53.70%) patients had “grade III” reaction and 4(7.40%) patients had “grade IV” reaction. Arm with 40 Gy have less no of grade III & IV reactions 3(6.3%) as compared with 50 Gy arm 33(61.11%), which is statistically significant (p-0.0001). Here four cases of “50 Gy group” noticed with severe "grade IV" skin reactions (extensive moist desquamation), one was an infected sarcoma in the scar area, and one had severe pain in the chest wall and ribs while in 40 Gy group no patients had grade IV skin reaction. Median follow-up of patients was of about 10.2 months with a follow-up of maximum of 20 months and a minimum of 3 months. While analysis all patients (100%) were alive and 86 (85.14%) were without relapse. Patients with relapse were 15 (14.85%) of which 5 (4.9%) with local-regional relapse and 10 (9.9%) far-off relapse. While analyzing, 4 (8.5%) patients had knowledgeable a local-regional relapse in arm A in contrast with arm B 1(1.8%) patients had a local-regional relapse, which is statistically not significant (p-0.12) that was higher in 40 Gy 15 fraction arm. After a median follow-up of the 10.2-month rate of distant relapse was higher in the 40 Gy group 6(12.8%) in comparison to 50 Gy group 4(7.4%), which is statistically not significant (p-0.36), which contributed to the higher rates of disease-free survival and overall survival in the 50 Gy group. The occurrence of "ischemic heart disease"; "symptomatic rib fracture"; "brachial plexopathy"; and "symptomatic lung fibrosis" was not accounted while the follow-up, and long-term follow-up is required to comment on these late toxicities. There were no patients with contralateral breast cancer reported in the follow up period. DISCUSSION: Our study aimed at providing a robust evidence base for clinical practice in breast radiotherapy by evaluating a generally used 15-fraction schedule with the worldwide standard based on “25 fractions of 2.0 Gy”. 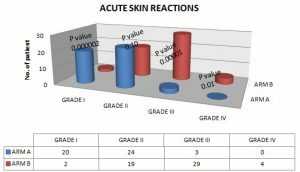 The analysis of acute skin reactions suggests that 40 Gy in 15 fractions over 3 weeks causes statistically significant less reaction to skin and subcutaneous tissue than a regular schedule of “50 Gy in 25 fractions over 5 weeks”. The observation is consistent with the “START Trial B” which suggests that “40 Gy in 15 fractions over 3 weeks” is equivalent in terms of late normal tissue effects in the breast to a total dose of 50 Gy delivered in 2.0 Gy fractions. 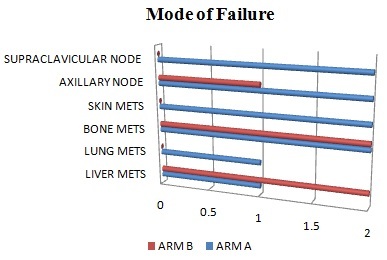 Quality of life in 40 Gy arm was observed to be better than in 50 Gy arm. Treatment time is 2 weeks less in 40 Gy arm, and it appears to be more convenient and economical for patients. The patient quality of life self-assessments of normal tissue effects in START Trial B is also consistent with this relation, suggesting 5-year estimates in favor of the “40 Gy group” in most of the evaluated normal tissue effects. The 10.2-month median follow-up is extremely short of allocating assessment of the entire potential late normal tissue effects alike cardiac damage. Follow-up of female patients within the trial is enduring to evaluate the long-term effect of the fractionation treatment plan. However, the RMH/GOC pilot data with a medium of 10 years’ follow-up demonstrate that even though estimation of unconditional rates of normal tissue effects changes by time, the relative effects of various fractionation schedules stay similar. The short-term priority is to protect the heart from radiotherapy exposure, something that is possible with the advanced radiotherapy technologies. The loco-regional, as well as distant relapse rate, was, seemingly higher in 40 Gy arm than 50 Gy arm, but it was statistically not significant. In comparison with other prognostic factors such as sample size, age, stage of disease, chemotherapy used, hormone receptor status in relapsed patients both the group have akin features. However, 64% patients of study belong to less than 50yr age group, and 56% were pathologically staged III, can be the reason of more chances of relapse, but there was no statistically considerable dissimilarity in both the arms. This raises a question about the efficiency of hypofractionated radiotherapy particularly in advanced stage breast cancer Monten and Lievens 11. A long-term follow-up is required to estimate the exact figure of locoregional and distant relapse. Since, both the arms are equally balanced in terms of hormone receptor status and all receptor positive patients received either tamoxifen or letrozole, it is less likely a cause of the difference in the loco-regional relapse rate. There are many factors which affect relapse, including others which were unknown in the trial. The idea of randomization is to guarantee equilibrium between unknown and known prognostic factors. We cannot attribute the survival variation to any biological or treatment-related factor and can only conclude that the difference might be owing to chance and could diminish with further follow-up. Long-term follow-up of these female patients is ongoing, to validate whether the relative effects of the schedules stay constant over time, in terms of late normal tissue effects as well as relapse and survival Ian et al. 12 The only other large trial to which our study can be compared is START B, that has given “40Gy in 15 fractions” in 3-week. A Canadian trial that examines “42.5 Gy in 16 fractions” of “2.6 Gy fractions” over 22 days against “50 Gy in 25 fractions” over 35 days in 1234 women after tumors exclusion for early breast cancer is also there. After the shorter schedule, the 5-year local relapse rates were 2.8% and 3.2% later than the standard 5-week regimen (absolute variation 0.4%, 95% CI–1.5 to 2.4%). The proportion of patients with clinically assessed excellent or good global cosmetic outcome was also similar between groups (absolute difference -0.6%, 95% CI –6.5 to 5.5%). The resemblance of "normal tissue effects" is consistent with the results of START B. By similar postulations applied above, “42.5 Gy in 16 fractions" is equivalent to “50 Gy in 25 fractions" in terms of late-onset "normal tissue effects" in the breast and chest wall. Reliable comparison of tumor control is limited by the small number of relapses in both the Canadian study (44 events) and START Trial B (65 events). But all the previous trials included early stage breast cancer patients only. CONCLUSION: After surgery for breast cancer, a radiotherapy schedule delivering “40 Gy in 15 fractions” over 3 weeks seems to offer significantly less acute toxicity as well as a good cosmetic appearance which is statistically significant. But in terms of loco-regional recurrence as well as distant recurrence 40 Gy schedule appears to be less effective especially in an advanced stage, although data was statistically not significant. A long-term follow up on the patients of this study will be analyzed the exact figure of locoregional relapse as well as distant relapse. CONFLICT OF INTEREST: No conflict of interest is declared by authors. GLOBOCAN http://globocan.iarc.fr/Pages/fact_sheets_ca ncer.aspx as accessed on 14/1/14, 2012.
http://www.iarc.fr/en/media-centre/iarcnew s/2010/globocan2008, php as accessed on 17/11/13, 2008. Nandi M, Mandal A and Asthana AK: Audit of cancer patients from Eastern Uttar Pradesh (UP), India: a university hospital-based two-year retrospective analysis. Asian Pac J Cancer Prev 2013; 14: 4993-8. Takiar R and Srivastav A: Time trend in breast and cervix cancer of women in India (1990-2003). Asian Pac J Cancer Prev 2008; 9: 777-80. Overgaard M: Postoperative RT in high risk premenopausal women with breast cancer who receive adjuvant chemotherapy. 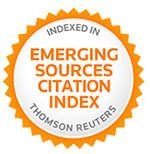 The New Engl J Med 1997; 337: 949-955. Regas: Adjuvant radiation therapy and chemotherapy in node-positive premenopausal women with breast cancer. The New Engl J Med 1997; 337: 956-962. Overgaard M, Bentzen SM, Christensen JJ and Madsen EH: The value of the NSD formula in the equation of acute and late radiation complications in normal tissue following 2 and 5 fractions per week in breast cancer patients treated with postmastectomy irradiation. Radiother Oncol 1987; 9: 1-11. Yarnold J, Ashton A and Bliss J: Fractionation sensitivity and dose response of late adverse effects in the breast after radiotherapy for early breast cancer: long-term results of a randomized Radiother Oncol 2005; 75: 9-17. Owen JR, Ashton A and Bliss JM: Eﬀect of radiotherapy fraction size on tumor control in patients with early-stage breast cancer after local tumor excision: long-term results of a randomized Lancet Oncol 2006; 7: 467-71. The START Trialists’ Group. The UK Standardization of Breast Radiotherapy (START) Trial B of radiotherapy hypofractionation for treatment of early breast cancer: a randomized trial, Lancet 2008; 371: 1098-110. Monten C and Lievens Y: Adjuvant breast radiotherapy: How to trade-off cost and effectiveness? Radiother Oncol 2018; 126(1): 132-138. doi: 10.1016/j.radonc.2017.11.005. Ian MT, Richard V, Peter CA, Brian D, Larry SG, Carol AH, Eric AK, Jeff M, Mack R III, Oliver S, J. Stuart W Jr. and Martha F: Adjuvant and Salvage Radiotherapy after Prostatectomy: ASTRO/AUA Guideline. J Urol 2013; 190(2): 441-9. doi: 10.1016/j.juro.2013.05.032. Kumar S, Singh S, Prasad SN, Korde M, Elhence A and Shakya V: A prospective study to compare hypo-fractionated radiotherapy versus conventional radiotherapy in carcinoma breast. 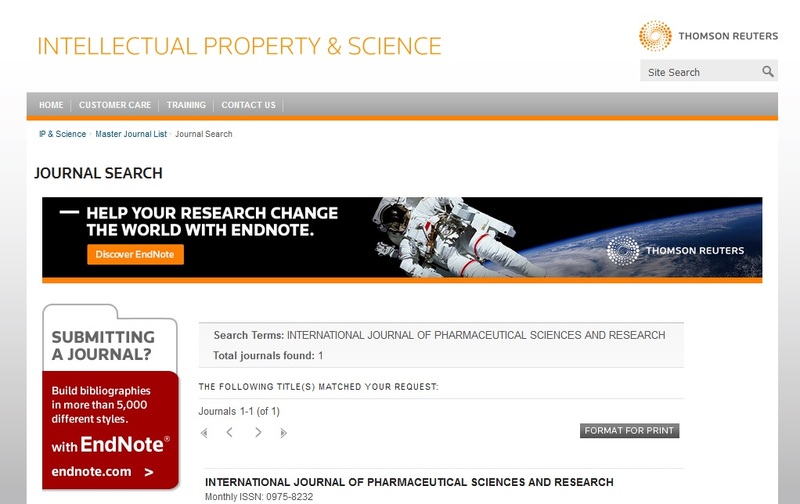 Int J Pharm Sci & Res 2019; 10(4): 2071-78. doi: 10.13040/IJPSR.0975-8232.10(4).2071-78. Authors Address: Department of Radiation Oncology, Super Speciality Cancer Institute, Lucknow, Uttar Pradesh, India.